The Museum of Modern Art acquired its copy of Barnett Newman's Broken Obelisk (1963-69) in 1971 from an anonymous donor. The Rothko Chapel has one too, but it only came to own it after a fairly torturous series of political fights. As the Washington Post's John Kelly and The Stranger's Jen Graves (another lifetime cast of the sculpture is at the University of Washington) have explained in great detail, the sculpture almost never made it to Houston. In 1969, to help acquire the statue, Houston had received a $45,000 federal grant, funding that philanthropists John and Dominique de Menil offered to match on the condition that the work was dedicated in honor of MLK, who had been assassinated the year before. The city council rejected the idea. The de Menils then proposed that the biblical line "Forgive Them, for They Know Not What They Do" be added to the pass of the statue, a suggestion that was also rejected. The work was supposed to sit in front of City Hall, and, as an activist told the Houston Chronicle in 2006: "[Mayor] Louie Welch was supposed to take it personally." The de Menils eventually decided to purchase the work for the Institute of Religion and Human Development, which is now the site of the Rothko Chapel. They dedicated it to Martin Luther King. Next month, the Menil Collection is publishing Art and Activism (an image of the book is below), a thorough, impressively even-handed look at the couple's philanthropic and cultural pursuits, and it contains two particularly great items that tell us a little bit more about what the de Menils and Newman were thinking. "Arts patrons Mr. and Mrs. John de Menil today challenged City Council to tell them why a modern sculpture they propose to help the city acquire should not be dedicated to the memory of Martin Luther King, Jr.
"'We understand you want to know why we have asked for this dedication,' de Menil said in appearance before council. "We cannot understand your objections and were deeply surprised when the proposed dedication was not approved." "I am very moved by what you have done and I feel with you, I am sure, a very special sense of happiness. After all it is not every day that we can stand up to the Philistines and win." 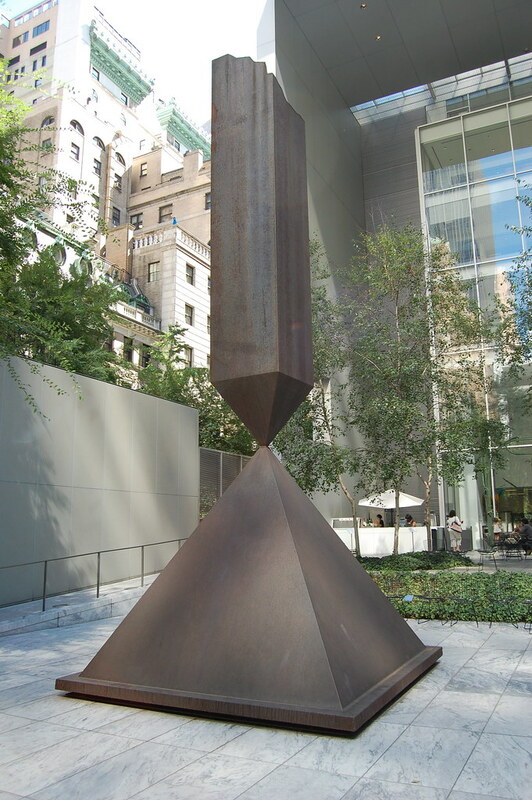 Knowing all of that, the Broken Obelisk looks even more exciting and even more rock solid in its current home in MoMA's sculpture garden. More: MoMA curator Ann Temkin has a nice audio piece on MoMA's site that discusses the work in the context of the political climate at the time that Newman was working on it. On an unrelated note: How great is this photo of John de Menil and Andy Warhol at the Expo 67 in Montreal? It's on the back cover of Art and Activism, and Wikipedia came through with it.